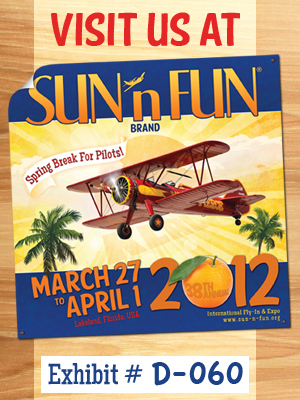 Here, you can keep track of our Sun ‘n’ Fun 2012 plans, including booth location and forums. Tune in to SNF Radio at the show (AM 1510) or online to catch up with us! We’re looking forward to a happy return to Sun ‘n’ Fun–with more sun and fun and less tornados. We’ll fill you in on our recovery from Sun ‘n’ Fun 2011, remind you of our great forums, give you directions to find and visit us, and give you a little insight into our offbeat, wonderful world.